Bellissima Couture and Welcome Home, Together Again! I was so thrilled to be asked to contribute a doll to the Golden Ticket Bon Voyage event at this summer’s Barbie Convention (for more information on this very cool event, look here). 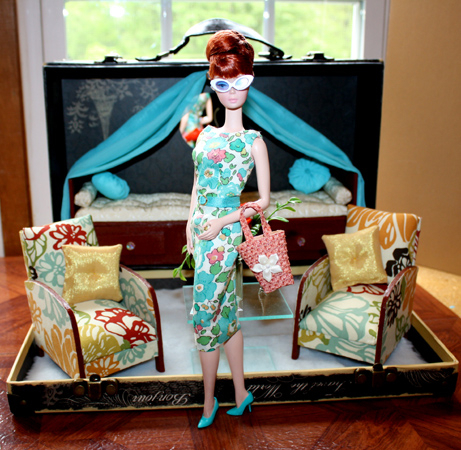 I had been looking forward to the theme of the Grand Tour for two years, so I immediately knew that I wanted Barbie to have a Stateroom and a travel wardrobe. The wardrobe, I could handle, but for the Stateroom there was only one place to turn, and that was to Maryann Roy, of Welcome Home. And boy, did she deliver! 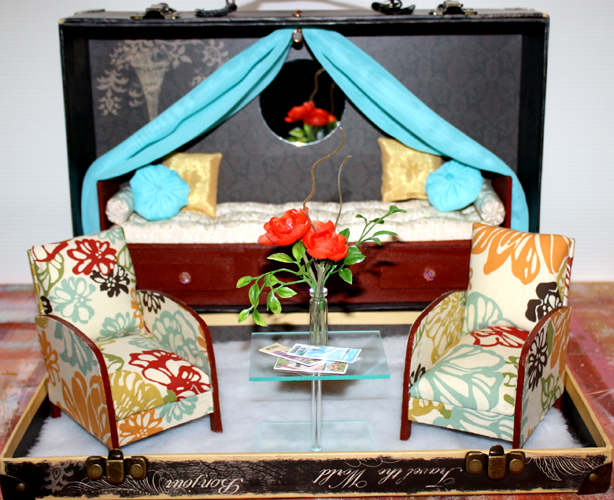 Here are some sneak peeks of the set that we created. It was such a fun project and we hope that you love it as much as we do. If you are attending the Barbie Convention this summer you will receive 20 Golden Tickets and 20 chances to win this set! We start with the Stateroom itself. It is cozy and elegant with a tufted daybed that also has ample storage space under the cushion. Two brightly patterned armchairs flank a chic lucite coffee table and a cozy rug underfoot makes slippers optional. The best part of all? All of the furniture can be packed away in the Paris-themed storage trunk! 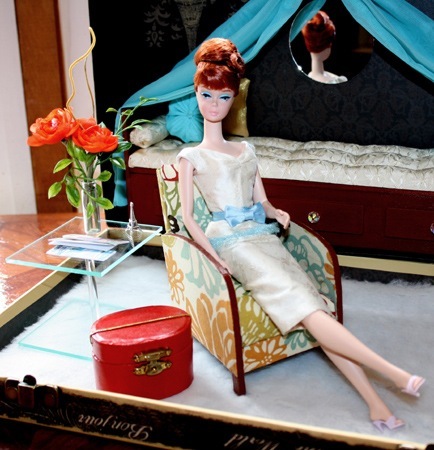 And here is Barbie herself, relaxing in her Stateroom and looking elegant in a Parisian ensemble in cream, figured silk that she has packed to wear to the Moulin Rouge. The top is trimmed with a pale blue tulle ruffle at the hem and a blue silk bow at the waist. Barbie’s makeup and her stunning red hair has been re-styled by Maryann. Her red leather carry-on bag, floral arrangement, Eiffel Tower and travel brochures are also included. Here, Barbie models a chic daytime look for site-seeing in London. She is wearing a sheath dress made from Liberty of London, that city’s most iconic fabric. Her chic straw handbag, turquoise pumps and stylish sunglasses complete the look. 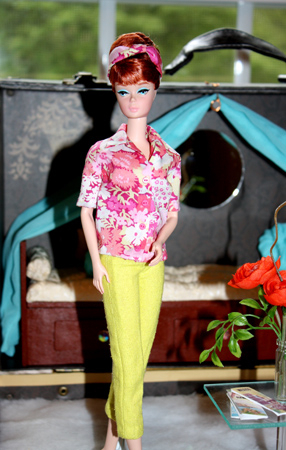 During her visit to Rome, Barbie plans to wear this casual ensemble of chartreuse silk noil capri pants and a bright, summery floral blouse in Liberty of London cotton. Her hair is kept in place with a knotted floral headscarf, even if her plans include a ride through the busy Roman streets on a Vespa! 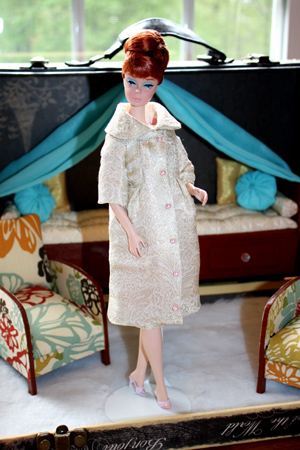 Finally, Barbie models her elegant evening coat ensemble in cream and pale gold floral silk brocade, lined in pale pink silk, that she plans to wear to the ballet in St. Petersburg. A pale pink silk petal hat tops off the ensemble. THIS IS A DREAM COME TRUE. It is amazing set! I wish I could bid on it. Thank you so much, Barbara! We had such a good time, as you can imagine. Stunning! There is so much wonderful detail in this set. Thank you so much, Val. Maryann did such a beautiful job and I always love all her exquisite, detailed touches. You two make a wonderful team! 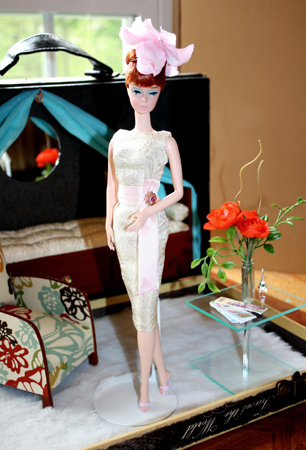 Every detail is wonderful and some lucky Barbie fan will have a dream come true when they win this! Great work! Love it all! Thank you so much, Constance! Hilda…you and MaryAnn have outdone yourselves on this set and I already know where my tickets are going!!! Absolutely STUNNING!!! !